Did you know that soil was alive? Many people do not realize this, something that on the surface may look look dead, but upon closer inspection is bustling with life! Many people have misconceived notions about soil, it is usually associated with words such as something being dirty or soiled. An inaccurate correlation to an element of our life that is so critical and and that is such a dependent element to our survival. Healthy soil goes hand in hand with a healthy environment. The first and most important step in improving soil health is to recognize that soil is a living organism and all parts of our ecosystem depend on it – it is vital to our survival, the growth of our food and maintenance of our ecology. There are billions of microorganisms that make up a whole network below ground. In one spoonful there are 600 million bacteria! Imagine that – there is an entire network of life below the ground, right underneath our toes. A network that works together with the trees, the plants, the fungus and so much more, all to be able to sustain life above ground for us – amazing! Soil, for example, is the measure of the health of biological systems. In other words, soil is the metaphor of our environment, if we have healthy soil we have a healthy environment. Annually, we are losing 1 percent of our topsoil per year, due to industrial agriculture, the process of mono-cropping, heavy chemical use and erosion of our soils. 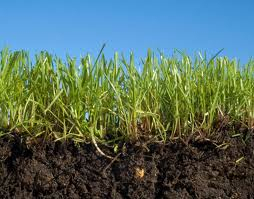 Just to put things into perspective – it takes thousands of years to form one inch of topsoil. Life in the soil provides the structure for more life, and the formation of more soil. Soil is equated to food and food is equated to life. The fertility and the quality of soil will determine the health and stability of all life that is relying on it – just as the health of each human being will determine fertility and the quality of their life. The reality is that a simple way to help maintain healthy soil and manage waste in your home is by simply composting. In essence it is an excellent free resource of nutrients for our plants and the earth. It doesn’t smell, but mainly, it reduces the amount of waste going to a landfill, all are creating the fertile ground for a microcosm universe to exist and for soil sustainability to flourish! Don’t know where to start? 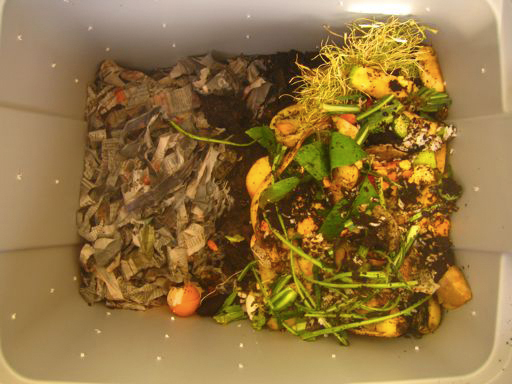 Check out our simple DIY Urban Vermiculture Composting post! We are all organisms working within one larger organism – called Planet Earth. Seeing on the micro and macro level, gives us a wider perspective into the many realms that are living in harmony here with us. Over the recent months, we are often been asked what the difference between heirlooms and hybrids. The answer is quite simple and straight forward. Heirloom traditionally means that the seed variety has been bred for its desirable traits, superior taste and vigor, having been passed down from generation to generation. The common timeframe for a seed to be considered heirloom is usually 50 years and represents that it is an open pollinated cultivar, not hybrid or genetically modified. Heirlooms are, in essence, a treasure, as they are packed with genetic information. The ritualistic tradition of seed saving, that has been occurring in our civilization for millennia, was developed using heirloom, open pollinated seeds. Many folks are familiar with the term open pollinated, but are not sure what it represents. In short, open pollinated varieties are non-hybrids and are originated from two open pollinated parents that will create an offspring similar to the parent plant with desired characteristics. Open pollinated seeds produce offspring that are true-to-type and are pollinated by the wind, insects, birds or other natural ways, they naturally adapt to your local micro climate, your soil and to you, hybrid seeds do not, as they are static. Open pollinated seeds are not hybrids or are genetically modified. Heirloom vegetables have been relatively new to the average consumer as of the past 10 – 20 years, but have been an integral in creating the global food heritage we know of today. Heirlooms are generally characteristic of their unique appearance, outstanding flavor and texture and of course a compelling history. Many people are surprised to learn that there are thousands of heirloom varieties unknown to the public and many of them disappearing. So why are treasured heirloom varieties disappearing? Currently, 75% of the global seed market is governed by 10 companies, uniformity, mass production, perishability and transportation are essential in their business model. These represent some of the many characteristics of heirlooms, from their quirky appearance, to their delicate nature and of course their inability to be mass-produced. The reality is that it took our ancestors 10,000 years to establish the array of foods that are available to us, a mere 100 years we had 96% more varieties to choose from. So why are heirlooms so much better? They conserve the genetic diversity of crops, preserve history and culture, promote bio-diversity and strengthen our eco-system through building soil and creating disease/pest resistant and drought tolerant seeds. The graph to the left gives an amazingly stark contrast to what has happened in our food system over such a short period of time and the sparse variety that we are left to choose from. The empowering part about this is that we are at the neck of the hourglass, that point in history, where we can make the right choices that are going to allow our future generations to continue to enjoy rare and delicious vegetable and fruit varieties. Farmers markets are a wonderful place to begin to acquaint yourself with what varieties are being grown, but if you truly want to see what is available, seek out heirloom seed catalogs. If you are gardener, consider only growing heirlooms and begin to explore some varieties that you may not have ever heard of or even considered, but you can be assisting in the reclamation of many of these treasured seeds. Most of all, save your seeds and share the with others. This knowledge is integral in the art of gardening and needs to be reclaimed. 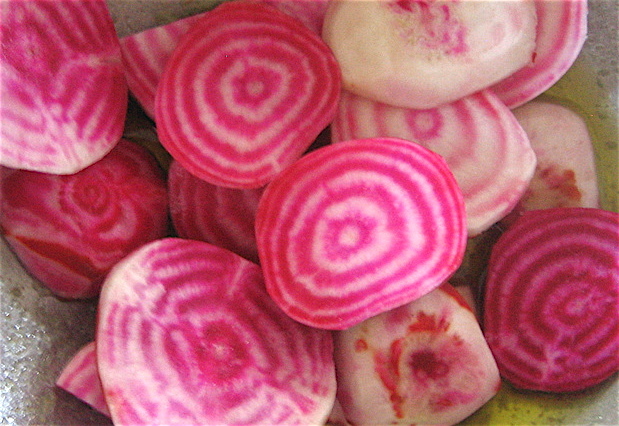 Keep in mind that many of these heirloom vegetables are not organic, do not let that hinder you from purchasing them. 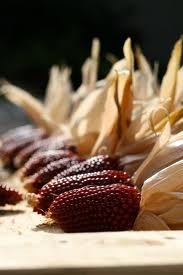 All you need to do is grow them our for one season organically, save the seed and you technically have an organic seed! 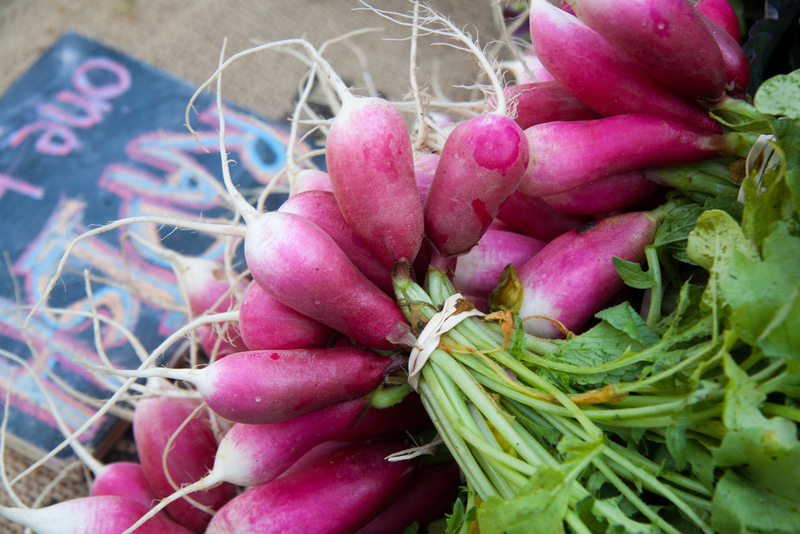 Another wonderful way to support the genetic diversity in our food system is by supporting your local farmers market and/or CSA (Community Supported Agriculture), both support small-scale farms and your local economy. Not sure where to find those near you? Check out Local Harvest. There has been much talk about hybrids lately, both good and bad and ultimately it is a decision that should be made, understanding what that means. Hybrid seeds originate from two different parent plants of the same specie, that were genetically crossed to create the hybrid offspring. 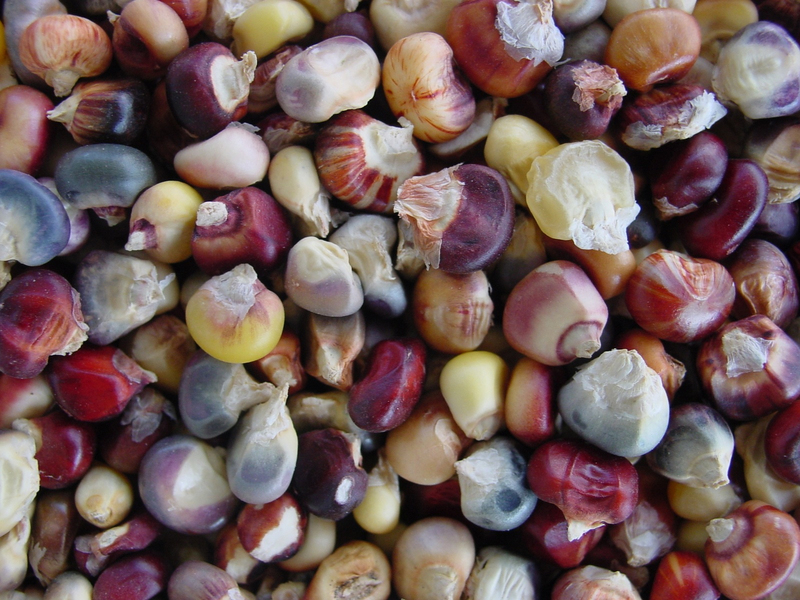 Seeds of hybrid varieties can be sterile or commonly fail to breed true to type, usually resulting in plant varieties that you do not know what you are going to get. Hybrids are generally referred to the acronym F1 (means first generation or filial offspring). Either F1 or the word hybrid has to be on the packet or plant to prove that it truly is a hybrid. 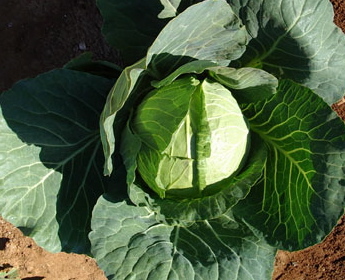 Hybrids can be stabilized, which means that the variety can begin to cultivate offspring that are more true to type. Stabilizing or de-hybridization can take about 8 generations of growing it out, until it gets to a point where the offspring are clearly stabilized. A common example is the famous Early Girl hybrid tomato, a now stabilized hybrid that became popular among home gardeners for its characteristics in early fruit ripening. Although it is considered stable, it is still marketed as a hybrid. It would not be conducive for seed companies to change the classification because then gardeners would begin saving their own seeds and opt out from buying that variety year after year. 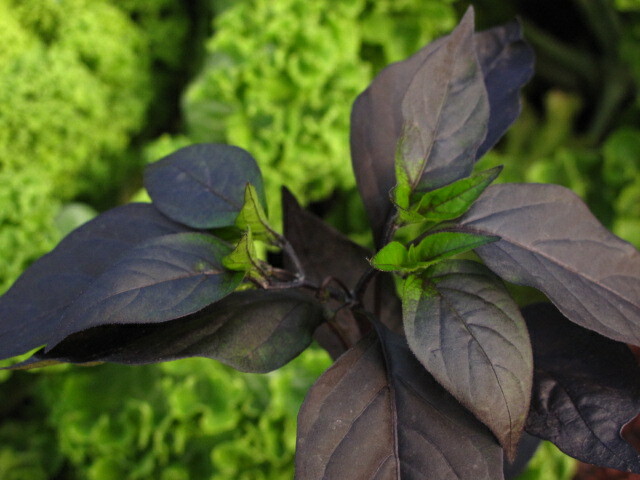 These modern hybrids have been developed by large corporations to suit their needs and demands, as they have been bred to yield high while compromising hardiness, pest resistance, flavor and quality. 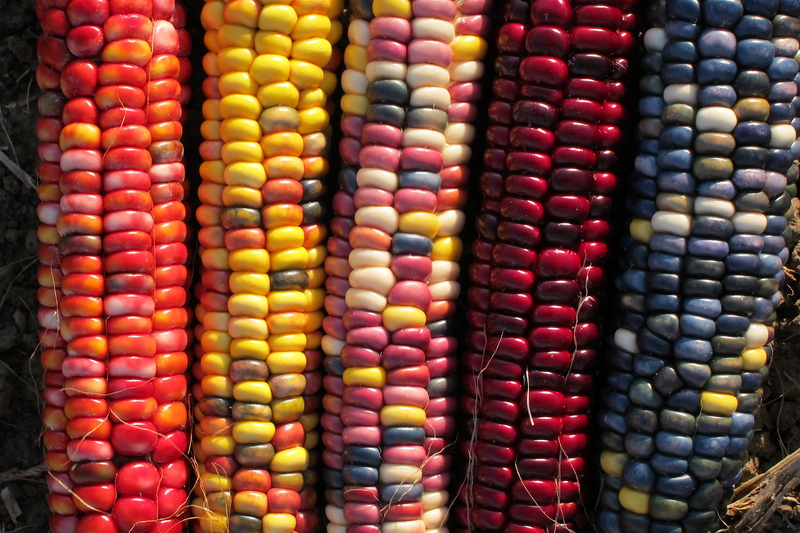 Generally the hybrid market sets a barrier to the re-integration of seed saving for the simple fact that companies make it very difficult to save hybrid seeds and you generally would not want to. 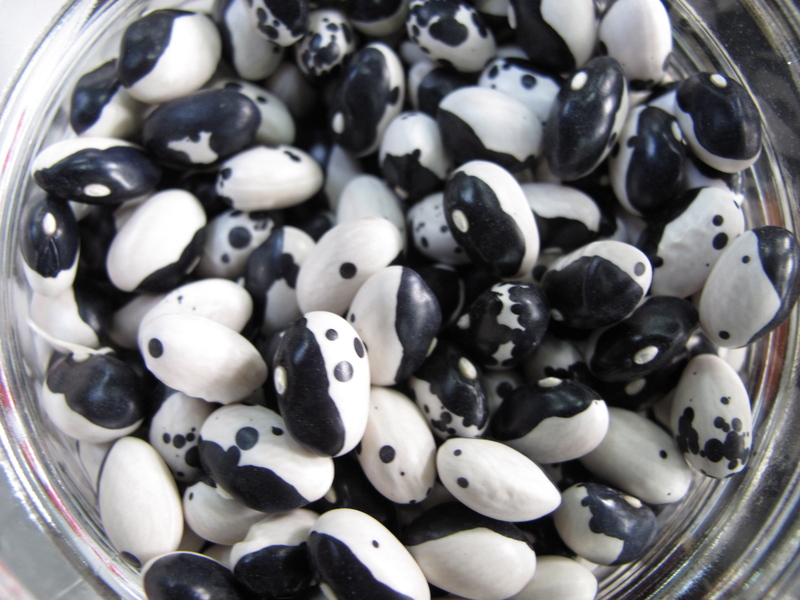 It is a market that is also dominated in Asia, making the seeds you purchase, adapted to a very different climate and soil. Keep in mind that Organic seeds can be hybrids, know who you are sourcing your seeds and your starts from. There is a lot of information available to us and learning about it, makes us better consumers. Here at The Living Seed Company, we believe every gardener should have the right to save their own seeds. Check out our newly created FAQ sheet or frequently asked questions, where we have compiled some of our commonly asked questions on the basis of seed differentiation – enjoy and pass it on! We just landed back in the West Coast after a two-week jaunt through the Mid West. Commencing our trip, was a stay with the man behind the scenes of Simple Good and Tasty, a wonderful blog about all things local, organic and cool. We were delighted to check out what is hip and happening in Minneapolis – from lake side eateries that tout local fare to late night bowling, all done by foot or bike … of course. We then made our way to Decora, Iowa, all while cruising through some of the most ferocious storms I have ever seen. At one point, I was convinced we were going to see Dorothy flying through the wind! None the less, we arrived at our destination, Seed Savers Exchange (SSE) at Heritage Farm and what a beautiful place welcomed us! We arrived to an intimate meet and greet with delicious food, wonderful folk music and a serious down pour! We were there long enough to register, have a bite, listen to some wonderful folk music and meet another fellow Californian, K. Ruby Blume, co-author of Urban Homesteading. The theme for this year was gathering. A modest yet poignant word that describes what occurred that weekend, while adding homage to the book Gathering: Memoir of a Seed Saver by Diane Ott Whealy, co-founder of SSE. 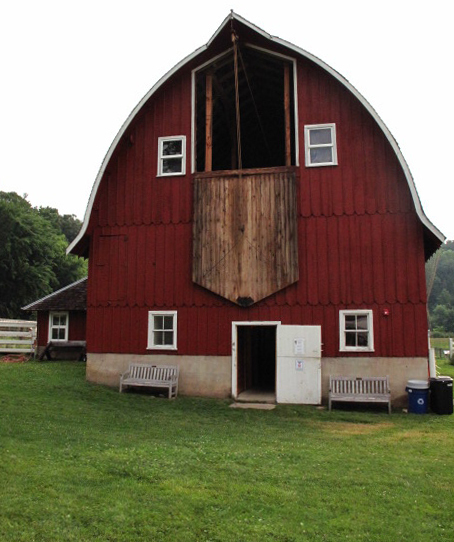 After a goodnight rest at our hotel room, we were back on the farm bright and early to start a full day of keynotes, workshops, eating, hay rides, barn dances and of course memorable connections with other seed aficionados. I attended a two-part workshop on dry seed processing with Will Bonsall, one of the major curators of the Seed Savers Exchange collection. A fascinating and very entertaining workshop that involved demonstration and some serious humor with an open style forum, where other seed experts like Matthew Dillon, co-founder of Organic Seed Alliance were able to jump in and offer their brilliance. One of the highlight keynotes was Woody Tasch of Slow Money, a man who deeply believes that if we believe in something, we should act on it. Tasch is the author and genius behind the concept of Slow Money: Investing As If Food, Farms and Fertility Mattered, borrowing from Schumacher’s Small Is Beautiful: Economics as if People Mattered. A poised man with so much passion and engagement that I believe he left leaving the audience with such optimism for the world we are co-creating together. The Slow Money set of principles help put into perspective the importance of acting on what we believe in, while awakening biophilia in the hearts and minds. Throughout the weekend we beat the high heat and scorching temperatures by submerging ourselves in the gorgeous stream that runs the property of SSE, giving us a sense of how sacred this land truly is! The momentum of the weekend continued to build as we learned, exchanged and connected with other incredible folks doing great work in the world such as Ira Wallace from Southern Exposure Seed Exchange and Carol Koury of Sow True Seed, among others. Sunday morning we awakened with the call of the birds and joined other nature lovers for the 6:30 am Bird and Flower Walk, an amazing opportunity to hike the trails and taste the wild and uncultivated varieties growing within Heritage Farm. Matthew Dillon began with a preacher’s salutation to begin and honor our last Sunday morning. It was another incredible keynote, taking us through an engaging oral history of seeds, the seed industry and of course his own path and bringing us back to the present, all while offering us a simple token of advice, live simply so others can live. He emphasized our need to see our food industry through the lens of a whole integrated eco-system, working with restorative agriculture, restorative seeds and restorative systems with our solutions laid in regional seed systems, succession, diversity and classical plant breeding. We wrapped up an incredibly dynamic and powerful weekend in the most fashionable way possible, learning wet-seed processing with Suzanne Ashworth, author of the book Seed to Seed. A book that has been our seed-bible since the inception of our company. Little did we know what we were in store for, Suzanne is a hoot, she had the entire audience laughing the entire lecture! 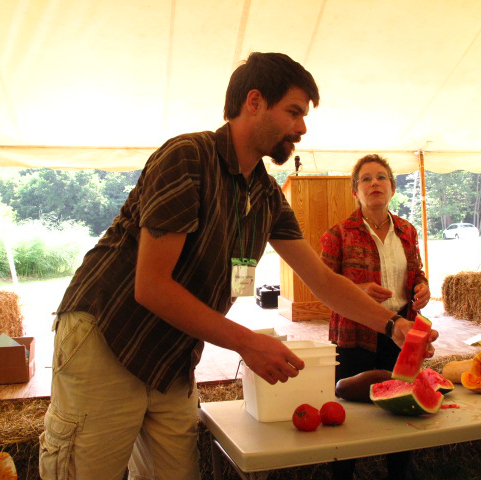 Within minutes she had Matthew as her personal assistant cutting up juicy watermelon and feeding it to the audience, all while teaching us the simple ways to wet processing! Needless to say, that weekend was so powerful and strengthened our movement and our work as a collective. The seed industry has ebbed and flowed through its various moments in history and today we can all be assured that we are weaving a new pattern in our ever evolving tapestry! * For the complete album of our trip to Seed Savers Exchange check out our Flickr account. * We made it to the SSE editor’s letter check it out! For more information on The Living Seed Company, check out our website. Today we are living through an exhilarating time in the history of food. 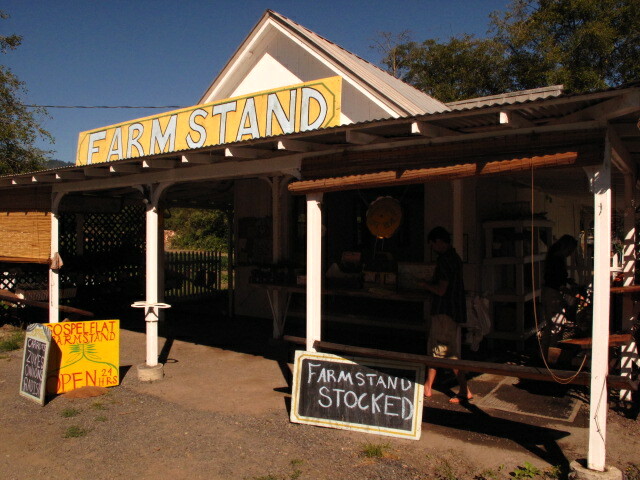 Despite news of food shortages or food security, folks all over the world are taking their food back into their hands. Despite that, 1 in 3 Americans is obese and most of the food found in our super markets, that is not organic, is genetically modified – there is a food revolution happening in the mist of all of this. As we know, we began as hunters and gatherers, eating and cooking solely what we could hunt and harvest, while saving seeds from our most prolific crops. Through time, technology, and the advancements of the industrial revolution things changed dramatically and quickly. We began canning, preserving and freezing our harvests while still growing our own food and sharing our bounties with our neighbors and loved ones. In the mid 1900’s, petroleum entered the food system, through petro-chemical fertilizers and the transportation of food and seeds. Today, most food travels 1500 miles to arrive at your market shelf. Despite being off-season and prematurely harvested, causing whatever fruit or vegetable to lose a significant percentage of its nutrition, these fruits and vegetables are responding to the demand of our public. Today, most Americans take very little regard in what they eat, how it is processed, what is in it and most of all, how much of it they eat. The irony is how much of our eating habits has changed in a mere 100 years – from our food supply, quality and quantity of food and nutritional content, to the amount of imported goods we consume. Perhaps a simple way of addressing this is we, went from viewing food as a sacred commodity to a simplified convenience. While most of America has accepted that we moved from an agricultural society to industrialized agriculture, to appease their cravings, there is a huge subculture that has sprouted up globally that is changing the way we eat. This movement touts local, seasonal and organic – converting backyards into food forests, front lawns making way for urban gardens and neighbors are taking down fences to create larger shared growing spaces. Maps are being created in urban settings for gleaners to be able to take advantage of the bounty of free food on public land. We are finding ourselves relying on our community as well as our neighbors. In essence we are adopting the ways of our ancestors. This is a movement that has taken root in all of America’s largest cities, while infiltrating small towns and growing communities. It is taking shape in the form of expanding farmers markets, community gardens, edible school yards, homesteading and a cross sector resurgence in farming. The beauty is that this food consciousness isn’t rising among rural farmers but rather it is being seen all across the board from urban hipsters all the way through minority groups, conservatives and religious folks as well. This is a movement that welcomes and encourages everyone to get involved and most of all to share in their harvest! Swapping recipes, seeds and gardening tips are no longer a thing of the past, but rather becoming a very common activity among family and friends, an initiation in taking back our independence by growing our own food supply is happening all over and it’s catching on! This change, among all these other alternative ways of living have stemmed out of our need as a society to not only find ways in sourcing our energy and water, but our food as well. With the current state of affairs, our convenience as Americans is not guaranteed, begin thinking of how much you rely on the outside world for your basic needs. Imagine the empowerment you would feel if you controlled the very essence of life – your seeds and food! Don’t have a yard? 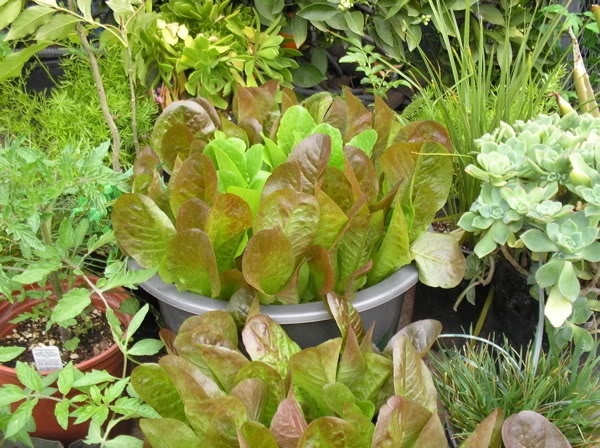 Fret not, food in pots grows incredible varieties of fruits and vegetable – you are only limited to your imagination – check out our blog real soon for articles on container gardening. Don’t have time to grow your own? Support your local farmers market or your local Community Supported Agriculture also known as a CSA – where you can have a box of beautiful organic fruits and veggies grown in a local farm delivered to your door weekly! These can be found throughout the country, check out Local Harvest for a location near you. 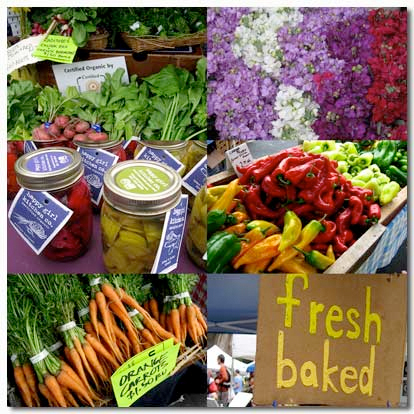 So what are the advantages to eating local and seasonal? With local food there are much lower energy costs and the nutritional value of your food is much higher, since the crop was not harvested early. Most of all, you are supporting your local farmers, your community and an incredible movement that is taking shape and changing the way we live! There is the classic adage that you are what you eat. The reality is that our habits around food have lost their value and now more than ever is a critical time to begin asking the right questions, being aware of what you are consuming and most of all, know where your food comes from. Composting is part of the natural process of decomposition, that naturally occurs in nature. A compost bin functions as a digester that breaks down organic matter, allowing nutrients to be assimilated back into the earth for continual benefit. The final product that is produced is known as humus – often referred to as black gold for its ability to regenerate the soil, act as a natural fertilizer, aerate soil, prevent erosion etc. Humus contains carbon, nitrogen, in addition to, beneficial bacteria and millions of microorganisms. It is not static but rather completely alive. It is an excellent component to even out soil variations, absorb water and support plant and animal life while assisting in the production of soil – a critical element in our evolution. Most solid waste in municipal settings is in large part food scraps. By composting of our food scraps, we drastically reduce our waste, which in turn, lightens the load on our landfills. Currently, our landfills are being exhausted at unprecedented rates. Landfills throughout our the country have closed, due to maximum capacity, forcing cities to truck or rail our garbage across state and international borders. Compost adds a rich nutrient to gardens, plant life and trees. Many city dwellers that may not have a garden to deposit their goods in, will donate them to neighborhood trees. When compost is placed on the earth, it helps to regenerate the soil of an immediate area, regenerating the soil structure and water absorption capacity. 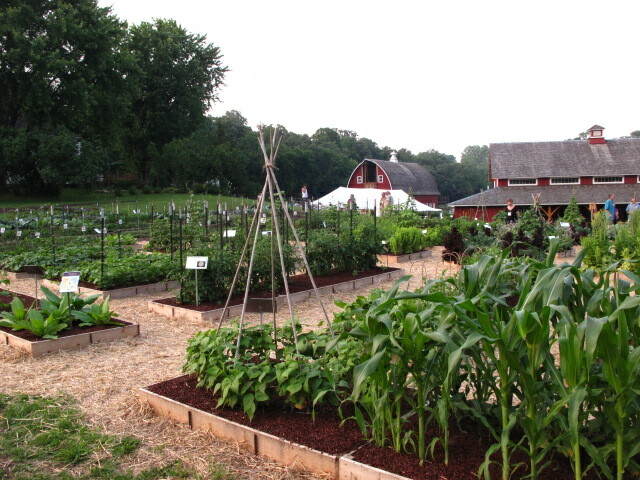 When gardens benefit from rich humus, the food will naturally thrive and produce healthy and nutritious food for you. There is no need to purchase synthetic chemical fertilizers that are contaminants your home, your health and the earth. Artificial fertilizers by pass the natural process with synthetic chemicals promoting the growth of weeds, disease and pests – while contaminating our health, and the air and water quality of a region. Balance For a compost pile to decompose properly, a sweet balance or proper alkalinity, must be maintained. 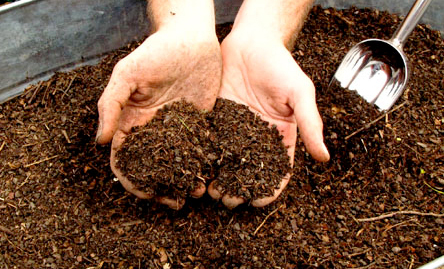 There are two elements that are necessary in a compost pile – brown and green material. Brown consists of what is high Carbon (woody, dried leaves, sawdust, brown, paper, egg cartons). Green consists of high Nitrogen (fresh produce, grass, food scraps, grass clippings or garden prunings, tea bags, coffee grinds, etc). The balance should be maintained at a ratio of about 30:1 (Carbon to Nitrogen). 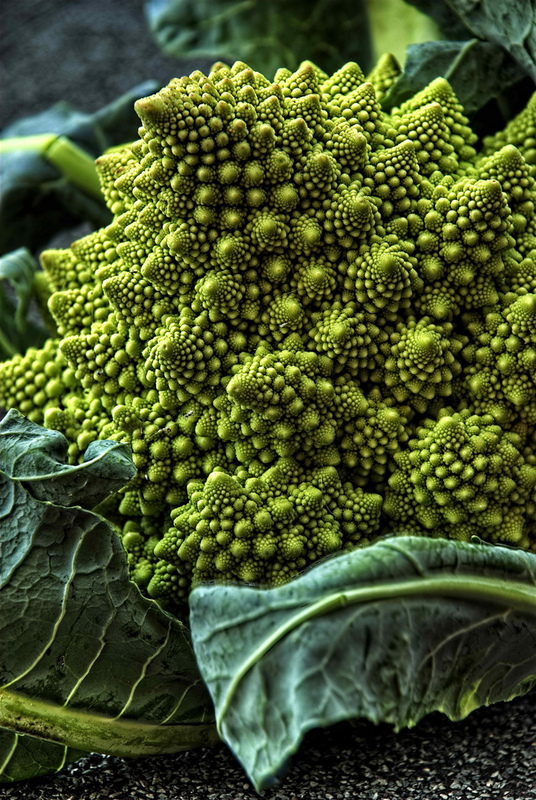 It’s not as complex as it sounds, this variation is usually found in the range of food people eat. No. Contrary to popular belief compost, when maintained under proper conditions, it does not smell. Finished compost will have the look, feel and odor of rich soil – depending on the conditions it may take from 6 – 12 weeks. Optimal conditions inside the bin are to be hot, but the heat will be generated naturally – it should not be left in direct sun. It can be stored in a patio, garage, basement, shed, or utility closet. There should not be an infestation of fruit flies either. There will microorganisms growing and even some mold may appear – these elements should break down. What Not to Add: You do not want to add: dairy, cheese, milk-related products, meats, bones, chicken, whole eggs, fat, weeds with mature seeds, pet feces, pressure/chemical treated wood. Animal feces carries pathogens and should not be added to your bin. You can create one specifically for your dog, but do not use it on your garden. Do not add food that is too moldy. Only add organic matter and do not add non-organic garbage, plastic, metal or glass. Best to remove stickers, rubber bands and tags that are placed on food. • Plastic Bin with tight lid. 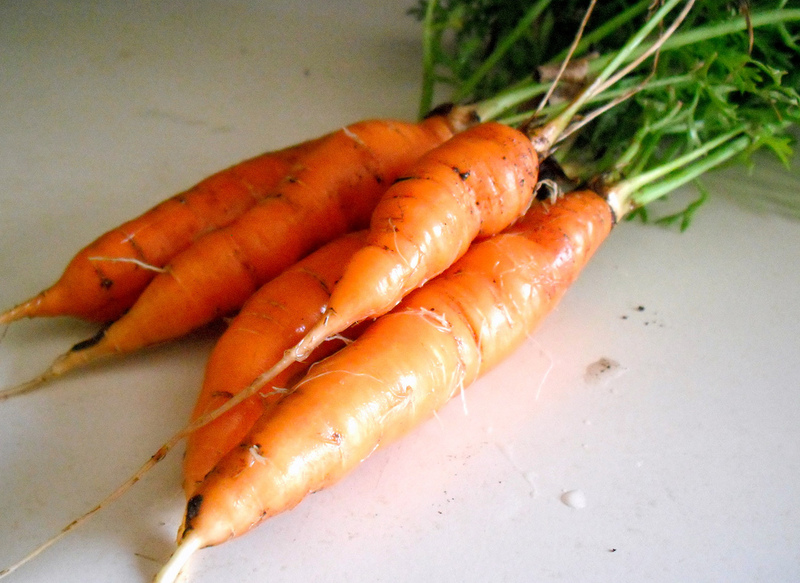 • Order worms online or retrieve a bag of existing compost with worms from a friend. • Newspaper – acts as the bedding and the carbon source, which will provide energy. The microbial oxidation of carbon produces heat. • Drill – 1/4” drill bit. • A pan the relative size to the surface area to the bottom of the bin. To determine bin size you need two square feet of surface area per person, or one square foot of surface area per pound of food waste per week. • Source a plastic bin. 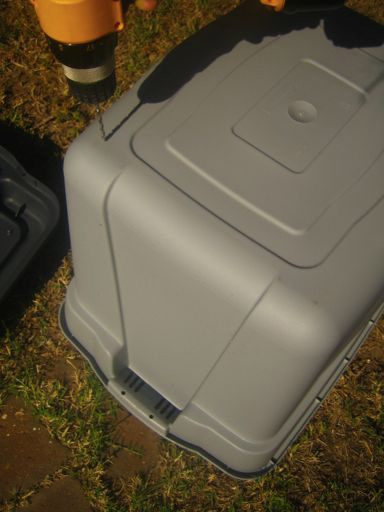 • 18 gallon bin accommodates 1 – 3 people. • The bin can be as small as 1 gallon pale for one person. I made one for my sister that lives in NYC and she had a thriving compost bin. I made of a one gallon plastic pale and I used the same instructions for this one, but applied it on a smaller scale. • A 32 gallon is perfect for a family for 4 + people. 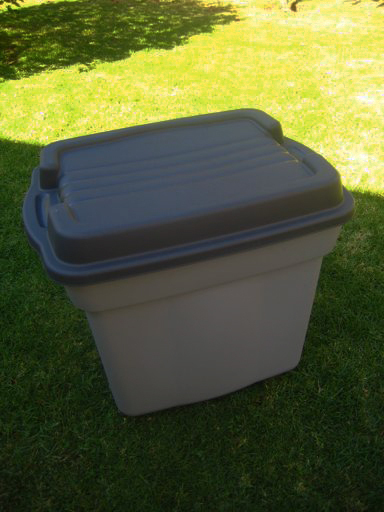 Try to find plastic bins at thrift stores or any used locations – I found mine in my dumpster! The bin will provide the home of the worms by creating the optimum conditions to break down organic matter into rich humus or compost. 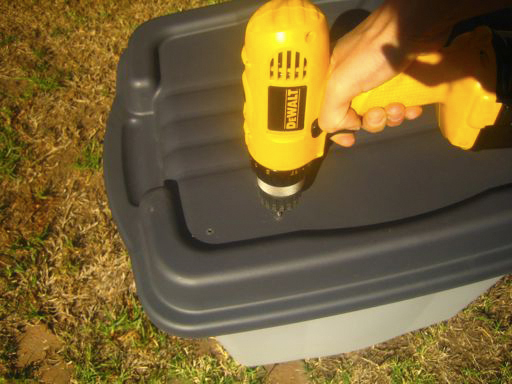 • Drill 1/4” holes all around the top and sides of bin. This will help to aerate the bin. • Space holes about 3 – 4” on top and on the sides. • Space holes on sides 3” apart in 3 rows – The holes are necessary to aerate the bin and allows the worms to breathe and allow oxygen to contribute to the decomposition process. Oxygen is an important part of the process, as it for oxidizes the carbon in the decomposition process. • Drill 3 holes on each side of 1” lip of bottom of bin. • Compost juice (aka castings) will be excreted from here. • Place bin on grass and allow castings to enter soil. • To harvest castings, raise with bricks over a pan or tray. It is highly recommended to collect this nutrient rich addictive. • Collect the castings and dilute with water 1:20. Castings are the excrement of the worms and is a natural fertilizer, soil enhancer and plant food. The worms will not come out – they prefer to be where the food is. • Find newspaper in your recycling bin or use any other carbon rich material ie: saw dust or brown paper bags. Newspaper is the most abundant material in an urban setting and an easy material to source. For this demo, I will be using newspaper as the source of carbon, should you decide to use something else, just replace it when newspaper is being called for. Straw is not recommended – length of time to break down is too long. 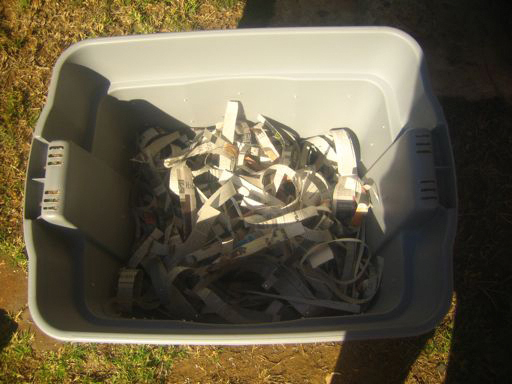 • Shred newspaper length-wise to 1” strips. • This creates bedding for the worms inside. 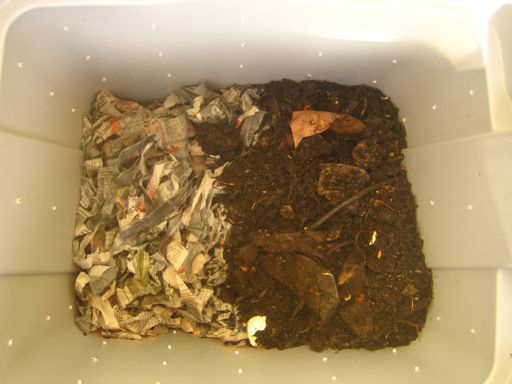 • Acquire enough newspaper to fill the bin (the bedding will give the worms the brown or carbon component needed). The worms will also eat the bedding, you will need to add newspaper accordingly. As you notice it go down, add additional shredded newspaper. • Place half of the shredded newspaper in the bin and soak newspaper to get all angels wet. • Ring newspaper like a wet sponge. Remove excess water, this will help create the optimum condition for proper moisture levels – like a wet sponge. • Fluff compressed moistened newspaper. • Purchase worms, specifically red wigglers (Eisenia foetida or Eisenia andrei) or acquire a bag from a friend. • You will begin using only one side and this will help in keeping the worms in one area. • Using one side will facilitate during harvesting. The worms will adjust and procreate according to the size of the bin – within due time. It is important to purchase the proper amount of worms to facilitate this process. 1 lb has 1500 worms is good enough for 1 – 2 people. The worms will adjust to the amount of food being fed and will self regulate. • Add food scraps to same side of bin. 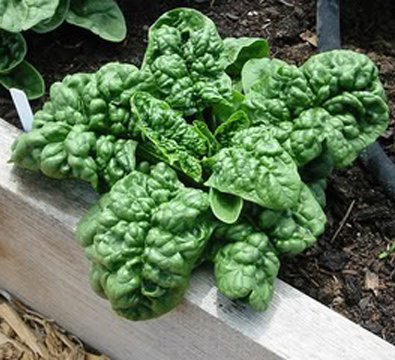 • Place only organic food scraps for compost used in gardens. Heavy metals found in pesticides and herbicides and possible GMO contaminated residue can stay within the decomposition cycle and be returned to your crops. This is your opportunity to truly know what goes into your food and your food supply. 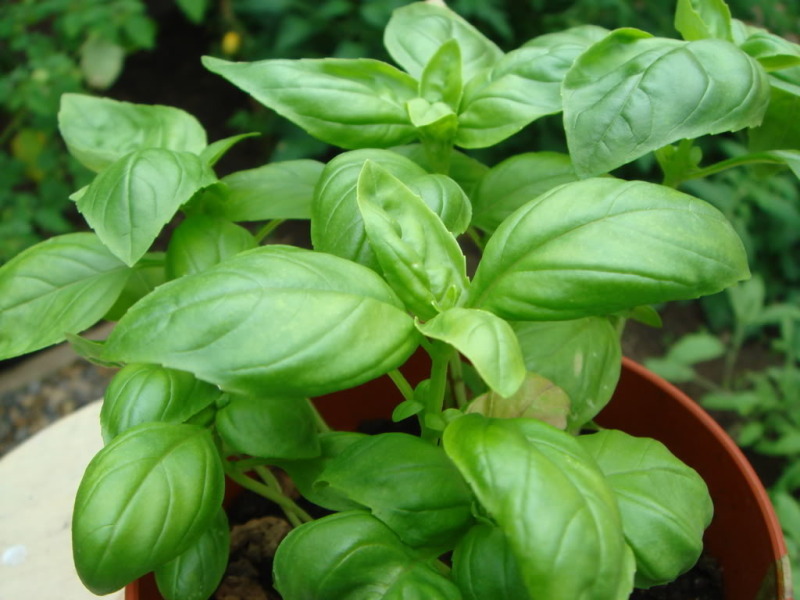 • Do not add big pits, excess citrus or weeds. Weeds that are seeding can continue to spread if compost does not get hot enough to kill seeds. It must reach 130 degrees to be assured of this – best to keep it if you are not sure. • Add the second layer of dry bedding over bin – covering the entire bin. This layer adds coverage and protection to the worms. • Continue to replace this layer as it gets eaten. • When adding food scraps remove newspaper, add food scraps and once again add newspaper and cover with lid again. • Newspaper should be fluffy and not compact and there should always be a layer covering the food and the worms. You will need to turn the compost heap every couple of weeks, mixing all the ingredients on one side. This will assure that enough oxygen reaches all areas. Depending on the size of the bin, the amount of food and the overall condition of the compost heap, will depend on the amount of times you will need to turn it. Start monitoring the conditions of your worms, moisture levels and overall appearance. You want to be able to gauge an issue, should one arise by simply looking at it – i.e. too wet or too dry. You will have a complete eco system, and it will self regulate as long as food is being provided and moisture levels are maintained. Keep in mind if you are only working with one side of the bin to try to keep contents ! ! on that same side. Depending on the weather and conditions, your pile may take from 6 – 12 weeks. Once you begin to notice most of the pile become a rich dark humus, you may be ready to harvest. Crush egg shell and cut up your waste to give it more surface area – this will help in the breaking down process. A simple way to harvest is empty the contents on a tarp and sift through it. The worms will crawl away from any light and into the protected space of an available pile. Another simple way is to scoop 1/3 of the humus and use generously. Don’t be concerned to take worms with you – that may be inevitable. For those that chose to use one side of the bin, start adding new bedding and fresh food to the side that has been left alone. After a couple of days, all the worms will have migrated to the other side. At this point you will remove all the contents from the composted side and use. If you are harvesting the worm castings as well, you will start to notice it in the tray, once it is ready. Collect what is there and dilute it 20:1 with water and use on your plants or garden. • Is there enough bedding? • Is there a material that should not be there? • Is it too wet/dry? • Is there an imbalance with the amount of food added? 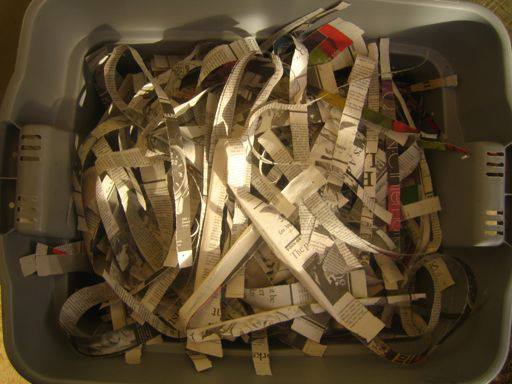 If it is too wet: Add additional shredded newspaper – stop feeding worms. Wait till a balance has been reached before continuing. If it is too dry: It may have become anaerobic – lacking oxygen. Add more food (produce) and consider adding some water. • Is there enough food? • Is it too hot? If it is too wet: Add additional shredded newspaper – stop feeding. If it is too dry: Add more food (produce) and consider adding some water. An easy way to collect your food scraps in your kitchen is by keeping them in a bowl or in a jar. Keeping it too air tight will cause mold. Make sure to not keep it out of the sun. Feed your worms regularly, this will assure them getting the freshest food and minimize smell and fruit flies. Storing it in the fridge is great option in hot and humid places; freezing is not recommended. 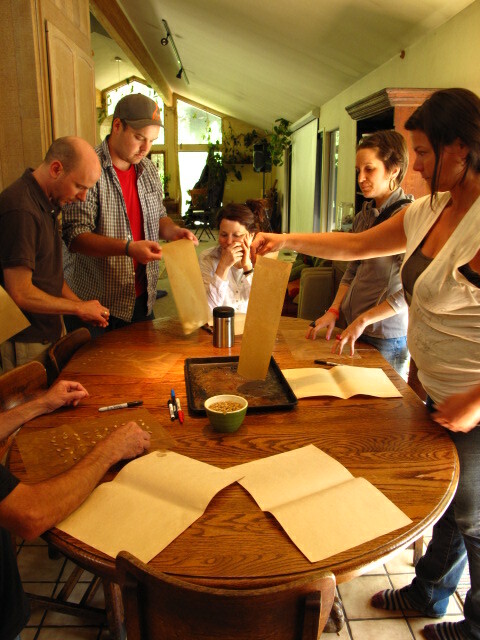 Last week The Living Seed Company hosted Seed School in Marin 2011 featuring veteran seedsman Bill McDorman. It was a five day intensive, where we were taught the seed industry from its inception as a form of currency, to our current global state where 10 companies own 75% of the world seed stock! 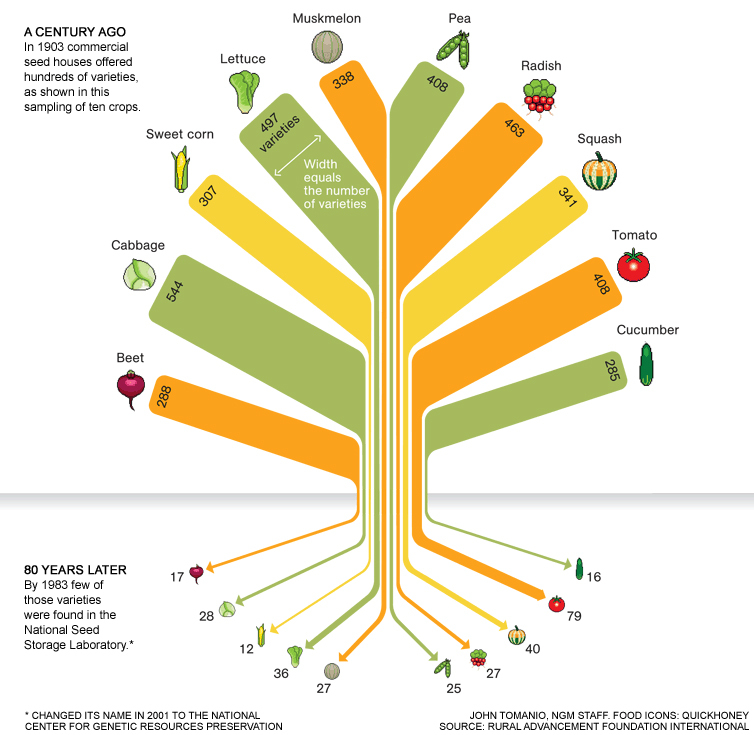 Since 1903, almost 96% of the commercial vegetable varieties available to to us are now extinct. We are here to change that by planting those varieties that are rare, while empowering everyone to grow their own food and most of all to save their seeds. This are beautiful times where we are being offered the opportunity to turn some of these statistics the other way, so that our children and our children’s children can see our generation as the one that regained control of our most innate daily ritual – eating. We were honored to have Bill walk us through this new path, he is the Executive Director of Native Seeds/S.E.A.R.C.H and having founded Seeds Trust/High Altitude Gardens he holds over 30 years of experience in this industry. With a beautifully positive attitude and the wisdom of this industry he offers a light for those of us working to inspire everyone to rise up to this historically moment in our lives. Last week the folks that attended Seed School 4, not only joined the age old tradition of seed saving, but we began to understand that the strength of our ecosystem is in our diversity. This tradition is the very thing that allowed for mankind to create and succeed in building civilizations. And it will be the very thing that will allow us to thrive and emerge from these times, once again with a diverse seed culture. We were visited by Rebecca Newburn, the brilliant shape shifter that created the Richmond Seed Lending Library in conjunction with the Richmond Public Library, they offer free seeds and education about growing and saving seeds. It is their hope that seed library patrons will return some seeds from their harvest to make the library self-sustaining. Later in the week, we took a field trip to visit International renown permaculturist Penny Livingston at her farm at the Regenerative Design Institute, as always it is a treat to visit Penny and James in their slice of coastal paradise in Bolinas. We learned about the varieties that thrive in this foggy climate, tasting their honey, touring their natural buildings while also witnessing two of their seed gardens in full creation! Personally, I have been unveiling the magic of seeds and participating in this course gave me the tools and the understanding to be able to ask the right questions. I will continue to formulate the tapestry of this mystery embodied in a seed. Check out our trailer for a peek on seed school Marin! I’ve written about seed saving in the past, especially with my prized Brandywine tomatoes whose heritage can be traced back to the people who first brought them to the US in the 1800s. But why are seeds important, and why does it matter where gardeners get them from? If you’ve seen documentaries such as The Future of Food or Food Inc, then you are aware of the way big businesses are reinventing farming and food production. Growing food used to be a community effort, and even when farmers started making money on their crops, it was still a family business. Fast forward to today when seed company Monsanto has actually created seeds that, when planted, produce a fruit filled with sterile seeds so they can’t be saved and planted the next year. While people all over the world (and even in our own city) are going hungry, we are actually creating food that limits future food production and makes us more dependent on the seed companies to sell us new seeds every year. WTF? The original idea for big businesses taking over the farming industry was this: if we can turn farming into an efficient system that is run more like an industry, we’ll be able to produce more food that can feeds more people for less money. Voila, a solution to the world’s hunger crisis! Good intentions, right? But then people got greedy. Big seed companies created genetically modified seeds that were hybrids or immune to herbicide, and even seeds that produced a corn which could act as its own pesticide, killing any bug that tried to munch on it. And we’re eating the food that is produced from those seeds! Ick. I don’t want to eat or grow those kinds of seeds. Astrid was kind enough to answer some questions for me (she is pictured below with her fiancé Matthew). Why are seeds so special? Seed are magical. Each seed is a miracle waiting to happen. After selecting seeds from the most robust plants in your garden and replanting these same seeds the following year, the plant will become more and more adapted to your soil, your climate and to you. The more you collect your seeds and continue that process the more they will adapt to you – now that is amazing! So, for someone who is just learning about the big business of seeds and agriculture in the United States, can you please explain why your seeds are different from the ones I buy from (for example) Burpee or the garden center at Home Depot? We do not sell any hybridized seeds, all of our seeds are open pollinated which means that you can save the seed and propagate a plant exactly like the parent. You cannot do that with hybrid seeds. Something a lot of people are not aware of is that a lot of seeds, even Organic, are being grown overseas, and all of ours are grown in the US. 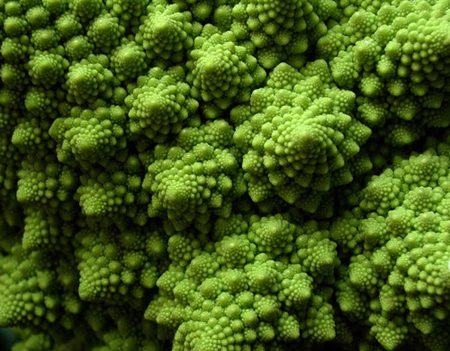 Seeds become adapted to the region where they are grown. If seeds are grown overseas, they are adapted for a completely different climate and soil structure. We created the Founder’s Collection as a way for us to help people plan their gardens throughout the year. We selected the best of the best and have chosen these 22 varieties for being widely adapted, productive, naturally disease resistant and nutritious. 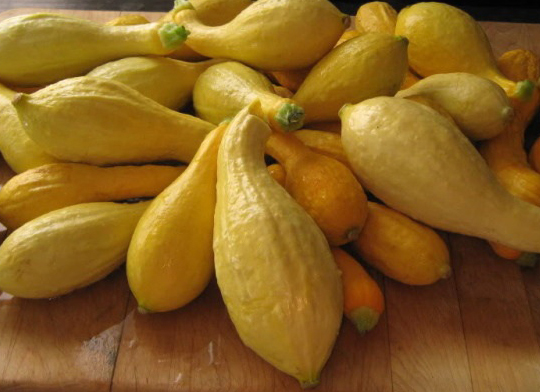 Every single variety has many uses other than being just a squash or a tomato. Many of them dry, can, ferment, freeze and preserve very well. 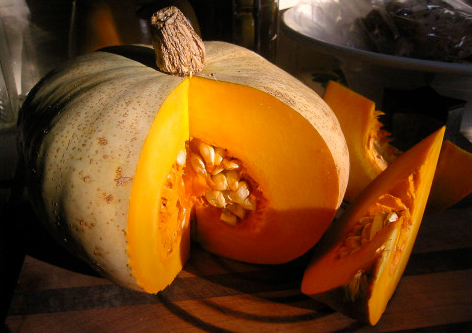 Our winter squash, for example, can be kept for up to 6 months in a cool place such as a garage. It can be used in baking as well as in savory dishes and best of all, the longer it keeps the sweeter it gets! Increasing the diversity of our food is so important, many companies are no longer offering the rare gems that still exist and need to be propagated. The world has lost 95% of our food diversity in just 100 years, and we are inspired to change that. 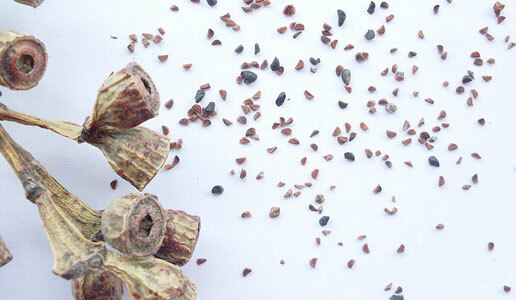 We are also really inspired to revive the ancient art of seed saving in every gardener. Why don’t more people supply seeds the way The Living Seed Co does? Is it an issue with money, time, labor, laws, etc? There are seed companies that do, but we have not seen companies offer a collection like the Founders Collection. It is a complete garden. Ultimately what we want is to get as many people as possible in the soil and reconnecting with the land. Our collection is a superior deal offered as a whole, perhaps it can be a lower profit margin but we want to insure people having a substantial amount of seeds for a relatively low cost. There was also a lot of time involved the creation of the collection. 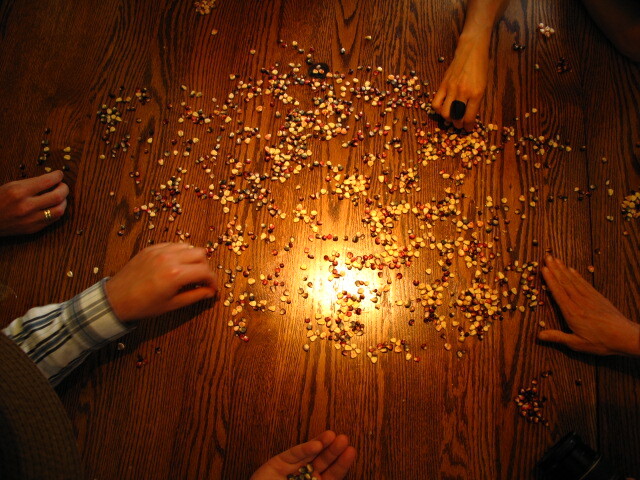 There was a lot of research that went into choosing each seed and its complement to the whole. The Living Seed Company has a big vision. How can seeds help save the world? We feel that gardening is a way to bring people and communities together to grow food, it helps people find their inner peace and outer prosperity. Also, gardens act like a small oasis for birds, bees and insects – offering a refuge to pollinate, mate and grow the biodiversity of a neighborhood. Even a window box can offer this on a smaller scale. Ultimately, we see growing food and seed saving as a way for people to thrive and learn things about themselves they did not know. The reward one gets in the act of growing food is indescribable and what you offer in return to the biodiversity of your area is so much! We became inspired to create this program as an opportunity for us to give back. There are a lot of school programs and low income urban gardens that need access to good seeds and we want to be that source! We want to inspire people all over the world to begin growing their own food. So for every ten collections sold we donate one to a school garden program or youth group.